Details of the Visit 6-13 July 2008. Mr. Nurettin KONAKLI, President of Strategy Development, Ministry of National Education, Ankara, TURKEY. Mr. Kenan ŞEREFLİ, Director of Science and Art Center, Yozgat, TURKEY. Mr. Mustafa EROL, Assistant Professor, Bozok University, Department of Physics, Yozgat, TURKEY. Mr. Uğur BÖYÜK, Research Assistant, Erciyes University, Faculty of Education, Kayseri, TURKEY. Mr. P. G. Michaelides, Professor, Dean of The School of Education Studies, The University of Crete, Greece. Mr. Simos Anagnostakis, Scientist, Special Teacher at The Department for Primary Education of The University of Crete, Greece. Mr Miltiadis Tsigris, Chemist, secondary school teacher attached at The University of Crete as Research Assistant, Greece. Mr Leonidas Tzianoudakis, Chemist, secondary school teacher, Director of EKFE of Rethimno (8 July 2008). Mr Giannis Siskakis, Physicist, secondary school teacher, EKFE of Rethimno (8 July 2008). Ms Valia Rompogiannaki, Biologist, secondary school teacher, EKFE of Rethimno (8 July 2008). The meeting took place at Rethimno-Crete, Greece (6-8 July, 2008), at Iraklio-Crete, Greece (9 July 2008) and at Athens (10-13 July 2008). During the meeting the partners involved had the opportunity to exchange experiences in Science and Technology teaching approaches. Reference material was handed over to be used with schools in Turkey. Also, visits to local education or political authorities were arranged in which areas of common interest were discussed and the possibility of direct cooperation was exploited. Meeting in the Prefecture of Rethimno. Discussions with the prefect Mr George Papadakis, the vice prefect for the quality of life Ms Maria Arhontaki and the vice prefect for development Mr. George Mpotonakis. Presentation of school education programs. Exploitation of the possibilities of cooperation. 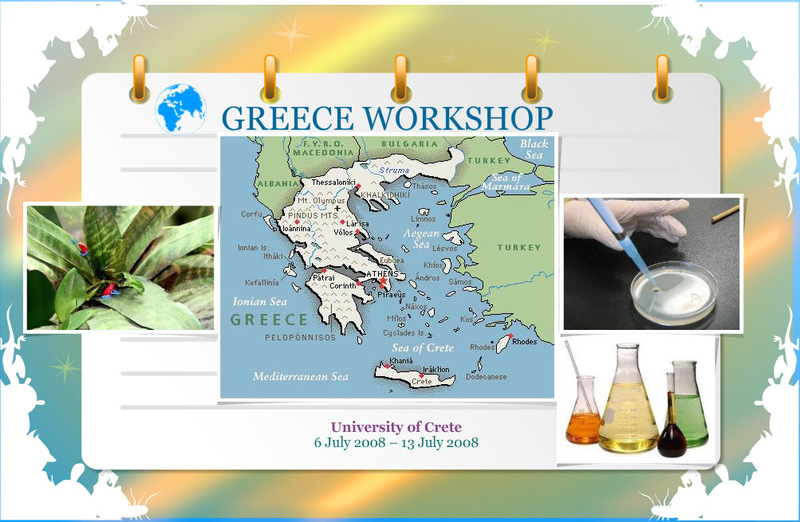 Monday, July 7, 2008 at 10:30 At The University of Crete. * Discussion and clarification of administration issues related to the MOBILIM project. * Overall presentation of the MOBILIM project by Mr Mustafa EROL, Bozok University, Yozgat, TURKEY. * Presentation of the AESTIT project, outcomes of which may be useful to MOBILIM by Mr. P. G. Michaelides,The University of Crete, Greece. * Educational Robotics for schools: Presentation of courses for school teachers and school students. Demonstration of Educational Robotics artefacts made by Department’s students. Results from test teaching in schools, by Mr. Simos Anagnostakis, The University of Crete, Greece. * Science experiments with self-made equipment: Philosophy. Presentation of some experiments by Mr Miltiadis Tsigris, The University of Crete, Greece. Discussions. At the Laboratory Centre for Natural Sciences (EKFE) of Rethimno. * Presentation of the mission of EKFE by Mr Leonidas Tzianoudakis, Chemist - Secondary school Teacher, Director of EKFE of Rethimno. * Pictorial presentation of local flora and fauna by Ms Valia Rompogiannaki, Biologist, secondary school teacher, EKFE of Rethimno. * Presentation of ’handbags of a competent experimenter’ - kits with simple materials for demonstrating Science experiments, produced by the personnel of EKFE of Rethimno. * Demonstration of Hands-on Experiments and experiments with simple means by Mr Giannis Siskakis, Physicist, secondary school teacher, EKFE of Rethimno. * DVD’s produced by the EKFE with Science experiments and demonstrations from the work of EKFE were given to be used with schools in Turkey. In Iraklio - Crete, Greece. * Meeting In Higher Education Institute of Crete (TEI) with Ms Hara Athanassaki, Professor, President of the Technology Higher Education Institute of Crete. Present were also: Mr E. Kapetanakis, Professor, VicePresident for Academic Affairs and elected as the next President (from September 1, 2008), the director of international relations office and other officials. Also Erasmus students from Turkey. Presentation of activities. Exploitation of lines of possible cooperation. * Meeting in The University of Crete with Mr. I. Papamatthaiakis, Professor, Vice-rector for academic affairs. Discussion of possible ways to expand scientific cooperation between The University of Crete and Institutes in Turkey. * Meeting in the offices of the Regional Directorate for Education in Crete with Mr Arkadios Spanoudakis, teacher, Regional Director of Education for Crete. Exchange of experiences. Exploitation of possible ways for scientific – educational cooperation. * Meeting in the Prefecture of Iraklio with Ms E. Schoinaraki, Prefect of Iraklion and colleagues. Presentation of school education programs. Exploitation of the possibilities of cooperation. 6 - 9 July 2008 In Crete. Apart from work, other activities were also going on. The University of Athens, Laboratory for Science, Technology and Environment, Athens. Meeting with Prof. George Kalkanis and his team. Discussions on areas of common interest. In Nea Smirni (in greater Athens area) - Laboratory Centre for Natural Sciences (EKFE). Meeting with the director of the EKFE of Nea Smirni and of the EKFE of Aegaleo and with their colleagues. Presentation of the activities of EKFE on Science in Schools. Discussions on areas of common interest. In Athens. Summarizing the meeting. Return from ATHENS to TURKEY.